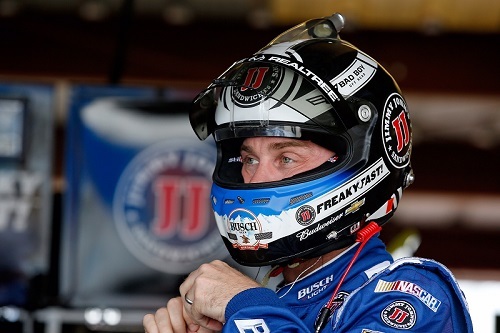 Stewart-Haas Racing and 2014 NASCAR Sprint Cup Series champion Kevin Harvick put the rumor to rest, disproving it, by announcing a long-term contract extension to keep Harvick in the SHR driver stable and behind the wheel of the No. 4 Cup entry that will change from Chevrolet to Ford in 2017. Harvick left Richard Childress Racing, his Cup racing home since he began in the series in 2001, to join Stewart-Haas in 2014. In his first year with SHR, he posted five wins en route to his first Sprint Cup title. He finished second last year on the strength of three wins, 23 top-fives and 28 top-10 finishes. So far in his third season with the team, Harvick has a win, five top-fives and nine top-10s in 12 races. Rumors of a Harvick departure began earlier this year, almost as soon as Stewart announced an SHR manufacturer switch to Ford, beginning in 2017. The primary basis of those rumors was the fact that Harvick has only raced Chevrolets in his NASCAR career, across all three national series, to this point. More recently, rumors got more specific with a rumored move to Hendrick Motorsports, the Chevrolet race team with which SHR currently has a technical alliance, replacing Kasey Kahne, despite Kahne still having another year remaining on his contract with HMS.